The MineralPure system consists of a microprocessor control box and a scientifically designed set of electrodes composed of copper or an alloy mix of copper and silver. Water is passed through a specially designed flow cell chamber that houses the electrodes and is installed on the return line of your existing pool equipment. The control box works by generating a precise, low-voltage DC current to the electrodes. Basically, the current causes some of the outermost atoms of the electrodes to lose an electron, thus becoming positive ions. While the water is running through the chamber, many of these ions are released into the water. 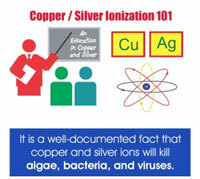 It is a well–documented fact that copper-ions help kill algae and silver ions help kill bacteria & viruses. 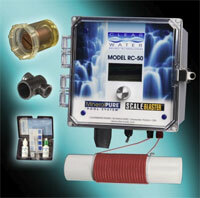 You can greatly reduce the need for chlorine with the MineralPure system installed. Only a small amount of an oxidizer will be required after a heavy bather load or a rainstorm. 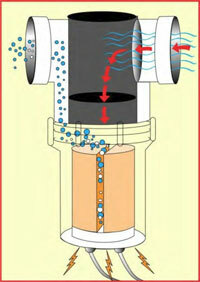 The greatest benefit of the MineralPure system is that the ions remain in the water providing a residual protection. They provide long-term, nontoxic purification and prevent against recontamination. Unlike other types of sanitizers, the copper and silver ions remain in the water until they flocculate, or form masses with algae and bacteria then become large enough to be removed by the filtering equipment. A simple test kit is included with the unit to maintain the proper ion level.